Welcome to Fifth and Sixth Grades. Fifth and sixth grade begin the “middle school” experience for North Lake School students. Students are housed in homerooms and travel to four content teachers per day. This model promotes content integration and strong collaboration among our team of teachers. Through their close knit classroom communities, the 5th and 6th grade teachers help students develop independence and responsibility. 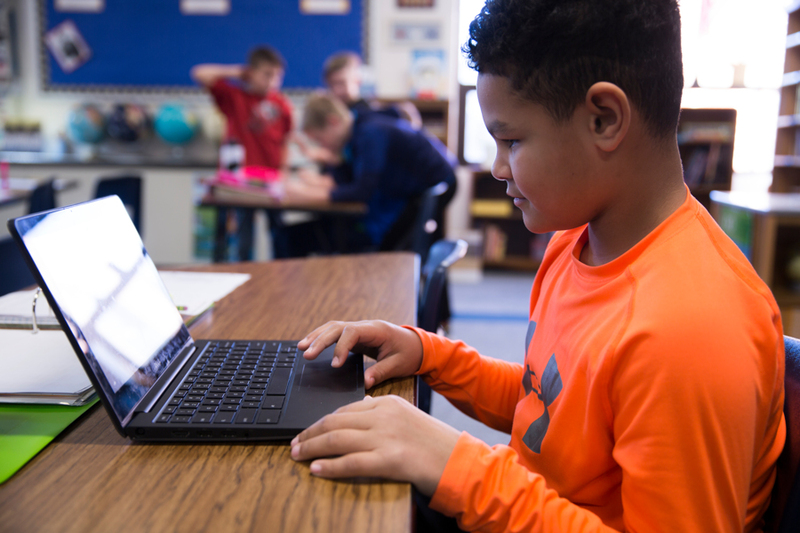 The general curriculum for fifth and sixth grade includes Math Expressions (Grade 5), Big Ideas Math (Grade 6), an integrated and thematic approach in literacy and social studies, and finally, a science curriculum based on the Wisconsin Academic Model Standards with an engineering emphasis. Our reading curriculum is Journeys Common Core. The unique close reading routine builds better readers while also providing intervention for struggling students. Easy organization, proven instructions, and exceptional differentiation make Journeys Common Core the reading curriculum for our K-6th grade learners. Fifth grade studies literature, literary genres, literacy skills, figurative language, writing genres, speaking skills, and listening skills. Students read, respond, present, write, and demonstrate in their literacy class. Once a quarter, the 5th graders and I will take a break from the Journeys routine and read a trade book (chapter book) together. Our focus will be on critical analysis and discussion of story elements, as well as the author’s use of figurative language. The study of science allows North Lake School students to experience the richness and wonder of the natural world. Later in life, they will face complex questions requiring scientific thinking, reasoning, and the ability to make informed decisions. Scientific knowledge prepares students for the future and helps them acquire skills needed in high school and beyond. North Lake students are excited and engaged in science topics/application and are exposed to the engineering process as well. Our curriculum includes several Engineering is Elementary (EiE) units and various resources. Welcome to 5th and 6th grade Social Studies at North Lake School! Our journey together begins with understanding the importance of the 5 themes of geography – Movement, Region, Human/Environment Interaction, Location and Place. The students know this as “MR. HELP”. Looking at the world through the “eyes” of MR HELP will help the students understand the places we study and make some very interesting connections as they begin to think like a Geographer. In addition to making connections and thinking like a geographer, the students will learn how to think like a Political Scientist, an Economist, and a Historian. Different perspectives will develop throughout the year, and we will begin to notice a more critical level of understanding about the world and our part in it. Our 5th grade journey takes us from a barren North American continent occupied by few natives thousands of years ago to a culture-rich continent filled with diverse groups of people, difficult decisions, and a newly crafted U.S. Constitution that is put to the test. Learning about U.S. History is an interesting and thought provoking experience. The culminating 5th grade experience is the State Visitor Center created by the students. Each student will research a state in the U.S. and will showcase their findings in a variety of exciting ways. The Foundations class is an introduction to civics and government for our 5th graders. This class meets twice a week throughout the 2nd semester. Mrs. Andorfer and Mrs. Loescher collaborate together and provide creative ways for the students to learn about what it means to be a citizen and abide by a system of rules. Another exciting component of this class is our preparation for BizTown – a simulated community field trip – where 5th graders experience being an adult for a day (having a job, paying taxes, going shopping…) and connecting it all to financial literacy. Sixth grade studies literature, literary genres, literacy skills, figurative language, writing genres, speaking skills, and listening skills. Students read, respond, present, write, and demonstrate in their literacy class. Once a quarter, the 6th graders and I will take a break from the Journeys routine and read a trade book (chapter book) together. Our focus will be on critical analysis and discussion of story elements, as well as the author’s use of figurative language. We are proud to offer this Common Core built curriculum written by Ron Larson and Laurie Boswell, leaders in the field of mathematics. The Big Ideas Math is a three year middle school series taught at North Lake School. The program uses a research-based strategy of a balanced approach to instruction and has made this series very successful. This approach opens doors to abstract thought, reasoning, and inquiry as students persevere to answer the Essential Questions that drive instruction. The foundation of the program is the Common Core Standards for Mathematical Content and Standards for Mathematical Practice. Students are subtly introduced to “Habits of Mind” that help them internalize concepts for a greater depth of understanding. These habits serve students well not only in mathematics, but across all curricula throughout their academic success. This series exposes students to highly motivating and relevant problems. Woven throughout the series are the depth and rigor students need to prepare for career readiness and other college level courses. In addition, the Big Ideas Math series prepares students to meet the challenge of standardized testing. The study of science allows North Lake School students to experience the richness and wonder of the natural world. Later in life, they will face complex questions requiring scientific thinking, reasoning, and the ability to make informed decisions. Scientific knowledge prepares students for the future and helps them acquire skills needed in high school and beyond. North Lake students are excited and engaged in science topics/application and are exposed to the engineering process as well. Our curriculum includes several Engineering is Elementary (EiE) units, the Prentice Hall Science Explorer textbook series, and other various resources. Welcome to 5th and 6th grade Social Studies at North Lake School! Our journey together begins with understanding the importance of the 5 themes of geography – Maps/Atlases, Movement, Region, Human/Environment Interaction, Location and Place. The students know this as “MR. HELP”. Looking at the world through the “eyes” of MR HELP will help the students understand the places we study and make some very interesting connections as they begin to think like a Geographer. Our 6th grade explorations take us throughout the Western World. When we “go to” the countries in the western part of our hemisphere, we will analyze our travels wearing the “hat” of a Geographer, a Political Scientist, an Economist, and a Historian. Together we will also study the social issues, economic impacts, and political decisions that affect citizens across our globe. We definitely gain a much deeper understanding and appreciation of the world in which we live. These experiences allow the students to connect to their world in ways they never thought of before. Writing, speaking, and technology are infused in this 6th grade elective class. This class meets twice a week throughout the 1st semester. Mrs. Loescher and Mrs. Andorfer collaborate together and have fun working with the students as they create their writing and speaking pieces. Our focus is writing, public speaking, and utilizing technology resources (Google platform and closed circuit monitors throughout the school) to create and share student work. The students collaborate together throughout the writing and sharing process.